We're in that transition time right now on our home river, but the same thing happens across most river all over the country. 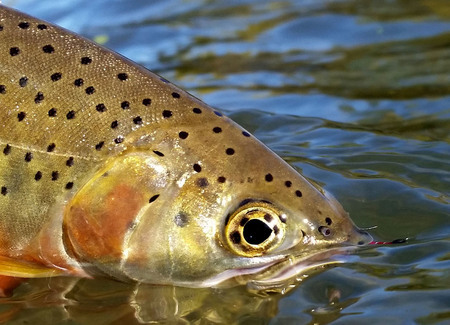 In the fall the food sources these trout have been relying on for the past several months begin to change. The first couple of frosty nights mark the end of the hopper supply, and a few terrestrials might linger but for the most part trout begin to rely on smaller aquatic prey and the hatches triggered by cooling water temperatures. Most of these hatches will be small Mayflies and are fished with nymphs, emergers, and dry flies when the angler can find feeding fish on the surface. The average size of fall Mayflies is typically pretty small. For us a #16 is on the big side this time of year, with #18 and #20's being standard. This means our strategies for nymph fishing these tiny morsels must be modified. These tips for light-line nymphing should help you out! *not exactly a "small nymph" but necessary in the fall! The light line nymph fishing can be amazing in the fall on big Western Style Rivers. It is remarkable. Maybe you can employee a few new strategies to improve your own fishing today. I wrote the bones of this blog piece back in 2014, and think its one of the most useful articles you can read. I recently posted an article about how to choose a strike indicator based on conditions, and today's article will further explain how yarn or New Zealand style wool indicators can improve your game. If you missed the article on How to Choose a Strike Indicator, see it here. Watch the video embedded below in its entirety. While we may not have a pro camera crew following us around, we do have some great intel to offer and I truly believe that some of you will find enormous benefit from this teaching. Bookmark this if you have to, its a pretty long article! But what else is new? We love fishing and can't help ourselves! What is "light line nymphing"? This term is a general description that guides often use to describe fishing flies (#16 and smaller), light tippets, lighter indicators, often using one single nymph, tiny split shot (if any), we don't hang up on bottom much, and we are generally fishing in water that might be spooky. In the fall, we are pretty much always "light line nymphing". "Regular Nymphing" might include bigger split shot, a Stonefly nymph, 2 flies, a 3/4" or 1" thingamabobber, lots of bottom tappage, faster currents or pools, and is typically done when flows are higher or maybe a bit off color. Standard fly lines are great for light line nymph fishing, rods should be 9' - 9'6" long and I personally think a 9' 4 weight with a fast action might be the best rod for the job. It is light enough to handle fighting fish on small hooks, mends great with yarn indicators, and still casts fine thanks to the fast action. A 9' 5 weight is great too, if you want to ultimate all around nymphing rod go with a 9'6" 5 weight for year round use. Why Alter Your Current Nymphing Setup? So you can catch amazing fall trout like this on midge patterns! That is why you should alter your setup. Plus, all anglers need to evolve and experiment. Don't ever let yourself fall into a rut, with anything in life. 80% of anglers run the same setup. A 3/4" Thingamabobber, Stonefly Nymph, split shot, Lightning Bug. 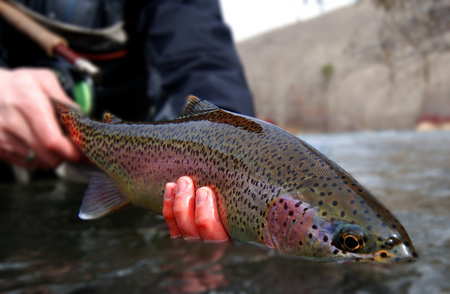 The rivers you fish change throughout the year and you should too! Light line nymph fishing is most advantageous for us in the fall. The water is low, clear, and the fish are condensed. Plus they have had every nymph in the box thrown at them all summer long haha! By September they are a bit harder to fool than they were in March. The trout see a #14 Beadhead Flashback Pheasant Tail behind a #6 Pat's Stone and laugh. You can't actually here the fish laugh, but if you throw this setup just watch for tiny bubbles. That is the trout laughing. Change it up. You will learn more about nymph fishing, become better at mending, and I believe you will catch more fish. Here is a macro shot of an Indicator I made using the New Zealand Strike Indicator Tool. The system is sold with wool, which works fine but when I ran out I used a couple strands of poly yarn and it worked great. Notice the tiny piece of plastic tubing that holds the indicator together on the line. I often put a perfection loop in my leader to build a "junction" for nymph fishing as well. You can tie off to this junction or use a traditional tapered leader. The RIO Indicator Leader is probably the best product out there. You will here some of this in the video but here are a few advantages. There are some disadvantages but most of those are not present in low, clear, fall time conditions. I personally use Thingamabobbers much of the summer and for Steelhead, but have fished Yarn vs. Thingamabobber side by side and seen the results. Yarn floats slower, more closely to the rate of the fly. You can see Yarn "lean" to identify micro drag on your drift. Yarn is quieter when being cast onto the water, and quieter when mended. Remember, this fall we are talking about here. It can be picked up in the air and mended into strategic positions. Things Yarn Will NOT DO! Tackle for Successful "Light Line Nymph Fishing"
Yarn Strike Indicators - You can trim these to your desired size. I strongly recommend having a few Yarndicators AND investing in the New Zealand system as well. New Zealand Strike Indicator Tool/Kit - This is a great product. I am totally sold on this. I have tested off and on this season and love it. You can use the wool that is made for it, or you can use "poly yarn" which is designed for crochet or fly tying when the initial supply that it comes with runs out. Ketchum Release Tool - should be required. Saves trout and flies. Get a Redington Zinger to clip it to your waders or vest for easy access. The next best thing to Yarn for small flies is the 1/2" Thingamabobber. I put one in the photo for scale, it is small and does some of things that Yarn will accomplish. This type of fishing is fairly technical in nature. In order to convince a trout that your teeny tiny #20 Midge pattern is real it has to be absolutely drag free. This means no drag, no tension, and the mend timing and mends must be perfect. As described on video and text above, the indicator also makes a difference. If the indicator floats too fast or is in a different current than your fly it won't drift correctly. Mend "overhand" using the tip of the fly rod. THIS IS ONE OF THE MANY REASONS WE BUY FINE FLY RODS. This finesse oriented mending is a joy with a fine rod. Not dissing some of the bargain rods, but getting that tip to move an indicator around the river exactly how you want it is where quality rods earn their keep. Set the hooks quick, but don't "snap it". (insert Hank Patterson jokes here please). Seriously, if you here your line tear through the water, snap, or "pop" as you set the hook you aren't "drawing it tight'. Hook sets should be a smooth backcast. Believe every take down is a fish. Luck is an attitude. I have seen anglers that believe every take down is a rock... they don't catch nearly as many fish as the angler believing its a fish. Cast like a hunter. Hunters get one shot at their quarry, make every cast count. You will catch more fish. This applies to all of your fly fishing. Practice the indicator "hop". Just play around a bit. Slack is good. It is better to get a bite and lost, than to never have gotten a bite. Sounds like some kind of ol' timers saying about love. There is a balance here. You'll figure out how to get the strikes first, then manage the slack line jjjjjjuuussst right eventually. Fish short first, then deepen up. Replace the perfection loop with a tippet ring! Am I right in concluding that when you mend this way you are trying to move the yarn indicator closer to the under water nymph? The mend itself doesn't move the nymph but after the yarn indicator is repositioned the nymph naturally drops down under the yarn deeper into the water. A couple of sketches would make what the mend is trying to do much easier to understand.